Wavesecure is a Google mobile phone tracker software based on Android, currently it supports Motorola Droid and Google Nexus One! 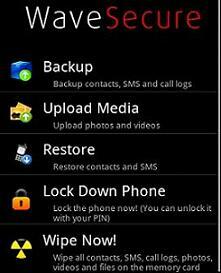 You can download Wavesecure for free util 31 Jan. 2010. It can lock your Google Android mobile phones remotely, restore your contacts and call/SMS history, and locate and track its location. When unfortunately you lost your Android mobile phone or just get stolen, you can lock down the data remotely, monitor its activity and use, and, more important hear back from your friends who got text messaged when your phone was tinkered with. If you wish, you could also have WaveSecure pin down the rough location of your cell phone. If you have sensitive information on your cell phone, you can wipe out them remotely, including contacts, SMS, call logs, photos and videos etc. This tracker software is compatible with other mobile platforms like Symbian and windows mobile as well. You can go to http://m.wavesecure.com to download the cell phone tracker software from either your mobile phone or computer. © 2010 Bluetooth,WiFi,GPS Cell phone tracking. All rights reserved.